CAMP KANGLEON, Palo, Leyte – The region’s second highest ranked police official was promoted as general after President Benigno S. Aquino III has approved the promotion to star ranks of Philippine National Police officials. Police Chief Superintendent Edgar Orduña Basbas, the Deputy Regional Director for Administration (DRDA) of Police Regional Office 8 (PRO8) was inducted to his new rank, equivalent to Brigadier General in the military, by PNP Chief Director General Alan LM. Purisima in a simple ceremony last week at the PNP headquarters in Camp Crame, Quezon City. Basbas, who gained admiration and prominence as Commander of the Regional Special Operations Task Group - Samar (RSTOG-Samar) in the recently concluded midterm elections, is a member of the Philippine Military Academy “Matikas” Class 1983. As RSTOG chief, Basbas is credited as one of those responsible in the peaceful and orderly conduct of the May national and local elections in the region. The RSOTG-Samar was activated during the election period to initiate focused police operations targeting wanted persons, accounting of loose firearms and dismantling ‘private armed groups’ in Samar province, which was then considered as an election “priority area”. Basbas was assigned to PRO8 in July 2, 2009 and headed the Regional Intelligence Division before being designated as Chief of the Regional Directorial Staff, Deputy Regional Director for Operation and currently as Deputy RD for Administration. He was promoted upon the recommendation of PNP chief Purisima and DILG Secretary Mar Roxas who is also the concurrent chairman of the National Police Commission. PRO8 director PCSupt. Elmer R. Soria exhorted the newly-promoted police general to assist him in ensuring the peace and order situation in Eastern Visayas and help attain genuine transformation in the PNP organization under the PNP Patrol Plan 2030 enhanced by the Chief, PNP’s CODE-P program. The Peace and Order Agenda for Transformation and Upholding of the Rule-of-Law or Patrol Plan 2013 is the PNP’s roadmap in attaining a highly capable, effective and credible police service by year 2030. The CODE-P program, meanwhile, is anchored on genuine police service or “Serbisyong Makatotohanan” and the need to enhance the Competence of each and every Police Officer; the need to undertake some Organizational Development and reforms; the need to instill Discipline within the ranks; the need to promote Excellence in the performance of the policeman’s duties; and the need to institute Professionalism at all levels of the police organization. CAMP LUKBAN, Catbalogan City, Samar – Combat troops of the 14th Infantry (Avenger) Battalion encountered a band of New People’s Army operating in Eastern Samar after receiving information from a concerned citizen that armed NPAs were seen at the vicinity of Barangay Tangbo, Arteche, Eastern Samar. The report was confirmed that the NPAs lurking around Brgy Tangbo were the same NPA group encountered by 81st Division Reconnaissance Company on July 26, 2013 at Barangay San Pascual Dolores, Eastern Samar. The said band of NPA were on the run as troops were sent out to pursue them, until they arrived in Barangay Tangbo where troops under 14IB caught up with them and engaged them in a 10-minute encounter. After the NPAs fled, the troops recovered one (1) M16 Armalite rifle, NPA documents and personal belongings. The fleeing NPAs suffered casualties as indicated by bloodstains in their vacated positions. Earlier, NPAs also suffered great losses when troops under 34th Infantry Battalion engaged them in a 45-minute encounter last July 27, 2013 in Brgy Rombang, Laoang, Northern Samar. In the said incident, one (1) NPA was killed and troops recovered two (2) M16 Armalite rifles. PASAY CITY – Representing oneself to another person having a transaction or business with the government is punishable by law once Senator Chiz Escudero’s proposed bill passes into law. Escudero, chairman of the senate committee on finance filed Senate Bill No. 118 (SBN 118) which shall also be known as the “Anti-Influence Peddling Act” which makes it unlawful for any person to engage in influence peddling. SBN 118 defines influence peddling as the act of representing oneself, either orally or in writing, as being able, whether real or imagined, to influence, facilitate or assist another person having some business, transaction, application, request or contract with the government in which a public official or employee has to intervene. The bill, which was also pushed by the senator during his first term in the Senate, seeks to nip corruption even before its inception and prior to any damage inflicted upon the government coffers. Escudero said the Anti-Graft and Corrupt Practices Act only penalizes persons who received a present, materials or any pecuniary advantage as well as those who, without official authority actually intervene, directly or indirectly in any transactions with the government. SBN 118 punishes any person who engages in influence peddling or the mere act of representing oneself to another, of not more than six years or a fine not exceeding one hundred thousand pesos or both, and disqualification to hold public office. On Monday, Escudero filed a resolution calling for a senate probe on the alleged “padrino system’’ at the Customs Bureau which implicates members of Congress and other influential groups and persons. CEBU CITY – Despite a sudden downpour last July 24, guests from across Cebu Province witnessed the unveiling of the first publication that compiles Philippine trees in the Visayas region and aims to provide comprehensive information about these indigenous tree species. RAFI Chief Operating Officer Dominica Chua emphasizes the value of native trees in biodiversity conservation during the launching of Manual of Native Trees in the Visayas last July 24 at the Eduardo Aboitiz Development Studies Center. Ramon Aboitiz Foundation Inc. (RAFI) launched the Manual on Native Trees in the Visayas at the Eduardo Aboitiz Development Studies Center, Cebu City. The manual is a compilation of 101 Philippine native trees found in the Visayas. The trees are grouped alphabetically according to the family classification each belongs to, and presented with descriptions that include their official names, scientific names, local names, methods of propagation and uses. Also included are practical tips on how to plant a seedling and how to nurture it to full growth. A glossary is provided to help readers in understanding technical words. The book launching was attended by Cebu Vice Governor Agnes Magpale, mayors from different municipalities of Cebu Province, and representatives from various government agencies, civic organizations, and academic institutions all over Cebu. Dominica Chua, RAFI chief operating officer, and Magpale formally presented Manual of Native Trees in the Visayas to the public through an unveiling of an enlarged version of the book cover. Free copies of the book were given to identified guests and partners. 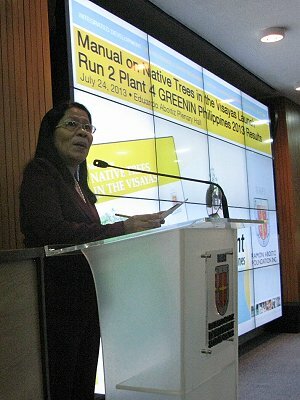 “RAFI has special preference for native trees due to their many benefits to surrounding flora and fauna,” Chua stressed. During the program, a presentation of the results of this year's Run 2 Plant 4 GREENING Philippines was also done by Marge Gravador, executive director of RAFI's Integrated Development unit. The free running and indigenous tree planting event was held simultaneously in over 40 municipalities of the Province of Cebu last June 29. Another initiative of RAFI in promoting biodiversity conservation is the RAFI Native Trees Nursery in Barangay Busay, Cebu City. The nursery houses 200,000 seedlings of 218 native tree species. Manual on Native Trees in the Visayas was conceptualized to contribute to the achievement of Goal 7 of the Millennium Development Goals, which is to ensure environmental sustainability by reversing the loss of environmental resources. Copies of the book are sold at P2,500 each at the Eduardo Aboitiz Development Studies Center, 35 Lopez Jaena St., Cebu City. Interested buyers may contact (6332) 418-7234 loc. 515 and look for Noel Fornolles. To know more about the book, visit http://rafi.org.ph/publications/native-trees. CAMP KANGLEON, Palo, Leyte – The Police Regional Office 8 (PRO8) urged the public to be extra vigilant to avoid being victimized by criminal elements following the arrest of a 29-year old jobless man who robbed a scion of a prominent family at a mall in Tacloban City and carnapped the victim’s luxury vehicle on Friday afternoon. “Criminals always look for opportunities to strike, the public must be extra careful and report any suspicious-looking person or any information on crime activities to the police so we can act immediately,” said PCSupt. Elmer R. Soria, director of PRO8. Soria identified the suspect as Jeffrey Salvacion, 29, single who was arrested by the police in a follow-up operation at his residence at Brgy. Guindaohan, Barugo town in Leyte where he hid after robbing businessman Elmer Mercado, 32, single, of Phase 5, Tangil street, V&G subdivision in Tacloban City. Investigation disclosed that Mercado had just watched movie at Robinson’s Movieworld at around 5:30 p.m. and was about to get his car parked at the Robinson’s Place parking area infront of Gerry’s Grill but was surprised when upon seating at the driver’s seat, the ballcap-wearing suspect was already at the backseat and pointed a bladed weapon locally known as “kutsilyo” to his neck and declared hold-up. The suspect demanded P100,000 from the victim in exchange for his liberty and to avoid being hurt but Mercado countered for a lesser amount of P20,000 in which the suspect agreed. The two drove to Petron gasoline station owned by the victim’s family some 100 meters away in Marasbaras district also in Tacloban City for Mercado to get money from the gas station cashier and a pay-off was made. Suspect fled using the victim’s black Toyota Fortuner with plate number HBA 546 while the victim, who was left unhurt, immediately reported the incident to Police Station 1 of Tacloban City Police Station. An alarm on the carnapped vehicle was immediately flashed and hot pursuit operation was conducted leading to the arrest of the suspect in Barugo town at past 8:00 p.m. and the recovery of the victim’s vehicle with the cash amounting to P19,500 and the bladed weapon used in the commission of the crime. Cases for robbery and carnapping were already filed against Salvacion who is currently detained at the Tacloban police lock-up cell. Meanwhile, Soria directed his men to closely coordinate with private security agencies manning malls and commercial establishments and to increase police visibility in these areas to avoid repetition of similar incident. Karapatan issued the statement today through its chairperson Marie Hilao-Enriquez. The rights group cited the previous actions and statements by Rosales which in effect promote impunity in the country. Karapatan noted Rosales’s recent statements blaming members of various people’s organizations for the brutal dispersal of the rally during Pres. Aquino’s State of the Nation Address. The human rights organization also took exception of Rosales’ statement condemning the participation of Dutch activist Thomas von Beersum in the said rally. “The permit of the organizers of the rally was denied, concertina wires and blockades were mounted along the highway where we marched. Despite our efforts to negotiate with the PNP, they treacherously started to push and beat our colleagues. The brutal police action prompted many of us, including foreign activists like Beersum, to express indignation. Rosales was quick to blame us, acting as the PNP spokesperson, instead of doing her job to investigate what actually transpired,” Enriquez said. “When poor people are left with no other choice but to defend their survival, it is just to exercise their legitimate right to protest. Ironically, Rosales chose to dispense with the role of the Aquino government, the local government, the Ayalas and the PNP in driving away the urban poor in North Triangle from their homes and livelihood to make way for big business interests,” added Enriquez. Karapatan also scored the CHR for the issuance of clearances for the promotion of human rights violators and Arroyo generals such as Brig. Gen. Eduardo Año and Brig. Gen. Aurelio Baladad. Karapatan opposed the appointments of Año, who is among the accused in the disappearance of Jonas Burgos; and Baladad who is among those responsible for the illegal arrest, torture and detention of the 43 health workers known as Morong 43. “We have strong reason to believe that the CHR and Ms. Rosales granted the said generals with clearances without considering the standing cases in court against them. The CHR denied our request for access to the clearance documents which they issued, a clear violation of the right of the people to information and access to public documents,” Enriquez asserted. “By acting as the defender of the PNP and the AFP, Rosales is clearly among the implementers of Aquino’s Oplan Bayanihan, which has already resulted to, and engenders more, human rights violations,” she concluded. 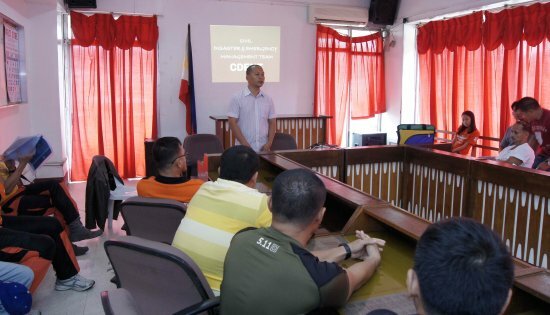 CATBALOGAN CITY – As Disaster Risk Reduction and Management (DRRM) becomes an increasingly serious concern in Catbalogan City, Orientation on Urban Search and Rescue (USAR) Operations held last July 22, 2013 at the Sangguniang Panlungsod Session Hall, was recently added to its list of activities aimed at preparing the city for any occurrence of disaster or emergency. The Office of Civil Defense Regional Office 8 (OCD-RO8) OIC Regional Director Rey M. Gozon conducted the said orientation for volunteers of the City Government’s local coordinating body known as Systematic Technical Emergency Preparedness – Unified Program (STEP-UP Tekwa Cares). As she welcomed the delegates and participants, City Mayor Stephany Uy-Tan thanked Director Gozon for personally spearheading the said activity. She also urged the volunteers who were present to become active partners of the City Government in ensuring the safety and security of the public. The said orientation is in itself a preliminary activity in preparation for the actual training to be held this September 2013, which will be participated in by representatives of the Local Council on Disaster Risk Reduction and Management (LCDRRM). Natural calamities in the form of floods and landslides in recent years have brought the public’s attention to the importance of disaster preparedness as another development indicator. This orientation as well as the eventual training was meant to increase the capabilities of the city’s volunteers in responding to pleas for assistance. The training will also be aimed at strengthening the city’s network of concerned agencies to make their response quicker and more effective. Enhancing the skills and capabilities of the city volunteers go hand-in-hand with the purchase of modern rescue and first-aid equipments made by the City Government last year to ensure a more comprehensive response to emergencies and disasters. Among the purchased equipments were CCTV Cameras that were installed in various streets to combat crime in the urban areas. Under the new administration, the STEP-UP was established as a 24-hour hotline to coordinate and facilitate the cooperation between various agencies and organizations responding to calls for help. The orientation on urban search and rescue operation and the incoming training comes at an opportune time as STEP-UP volunteer aides go into full working mode with the recent connection of GLOBE and BAYANTEL phone lines meant to accommodate as many emergency calls as possible. CAMP KANGLEON, Palo, Leyte – The Regional Special Operations Group (RSOG) on Wednesday arrested a notorious drug pusher and his sister during a raid in Burauen town in Leyte. Police Regional Office 8 director Chief Superintendent Elmer Ragadio Soria identified the suspects as Melardo del Pilar y Sosing and his sister Adelfa Olino y del Pilar who were arrested in buy bust operations and raids together with one Ricardo Araña alias Kadoy for bearing unlicensed firearm. At around 4:30 p.m., RSOG led by PSInsp. Dinvir Revita, with elements of Burauen Municipal Police Station led by PCInsp. Federico Sanchez, conducted simultaneous buy-bust operation and implementation of a search warrant issued by Executive Judge Yolanda Dagandan Regional Trial Court Branch 15 in Burauen, Leyte at the residence of del Pilar in Brgy. San Jose West. Police recovered from the suspect during the buy-bust two heat-sealed transparent plastic sachet containing white crystalline substance suspected to be “shabu” and one P1000 bill with serial number WV636250 buy-bust money. Subsequent raid resulted in the seizure of one medium heat-sealed transparent plastic sachet containing suspected to “shabu”; several drug paraphernalia; one hand grenade; one caliber .22 rifle, and one magazine for caliber .45 containing 7 live ammunitions. Same police team proceeded to the residence of Adelfa Olino at Brgy. San Jose East, some 1.5 kilometers from his brother’s residence, and also conducted simultaneous buy-bust and raid that yielded two small heat-sealed transparent plastic sachet containing suspected “shabu” and one P1000 bill with serial number UW184950 buy-bust money. Lawmen also recovered during the implementation of search warrant one heat-sealed transparent plastic sachet containing suspected “shabu” and several drug paraphernalia. Also arrested during the operation was Araña who was carrying an unlicensed .45 caliber Colt MK IV pistol with serial number 217533 with two magazines containing seven ammunitions each. The suspects were detained at Burauen police lock-up jail as charges for illegal possession of drugs and guns are being prepared against them while the seized items were forwarded to the Regional Crime Laboratory Office 8 for examination. Soria said the arrested suspects are considered “high value targets” and have been under surveillance by authorities the past weeks.